If you are a soccer fan, or in Europe, a footballer fan, then Hublot has you covered – in a way you probably never even imaged. Here in Baselworld today, the brand unveiled its first-ever connected watch, and while that is big news, it is not the big news. Nope, the big news here is that in addition to the Intel and Google smart technology, Hublot worked with FIFA to incorporate some pretty extensive soccer technology. In fact, the Hublot Big Bang Referee 2018 FIFA World Cup Russia™ watch will buzz every time a goal is scored; it will flash statistics, players names, player changes, and even let you check out how your rival team is doing. 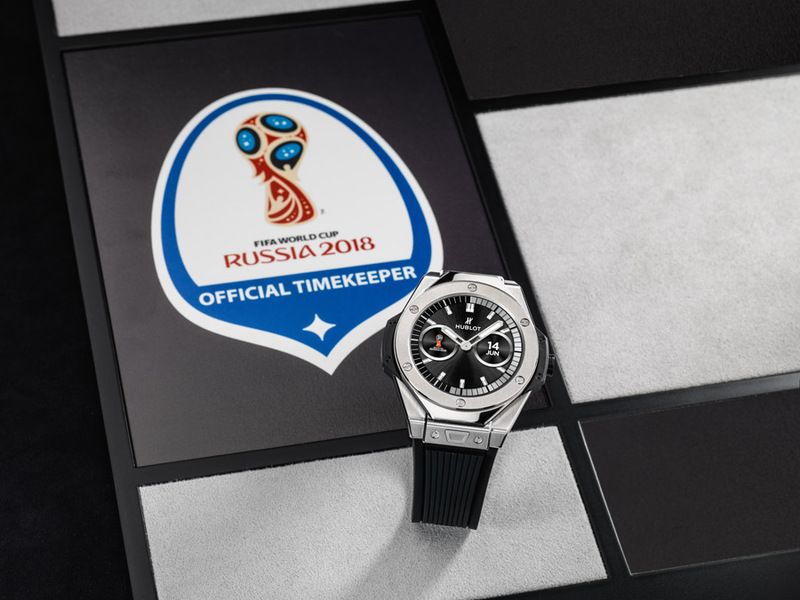 Being the largest watch brand involved in soccer – with a decade of sponsorships behind it—Hublot’s role this year as Official Timekeeper of the FIFA World Cup™ Russia, and as the Official Watch of FIFA, called for a big, bold move. Hublot executives deemed it the right time to offer football fans a watch that would truly be in their zone. That meant a smart watch dedicated to the globally beloved sport. Both analog and digital versions of the Hublot Big Bang Referee 2018 FIFA World Cup Russia™ Connected Watch, are available. Each 49mm titanium watch, offers smart watch functions, but from there…. it deviates. 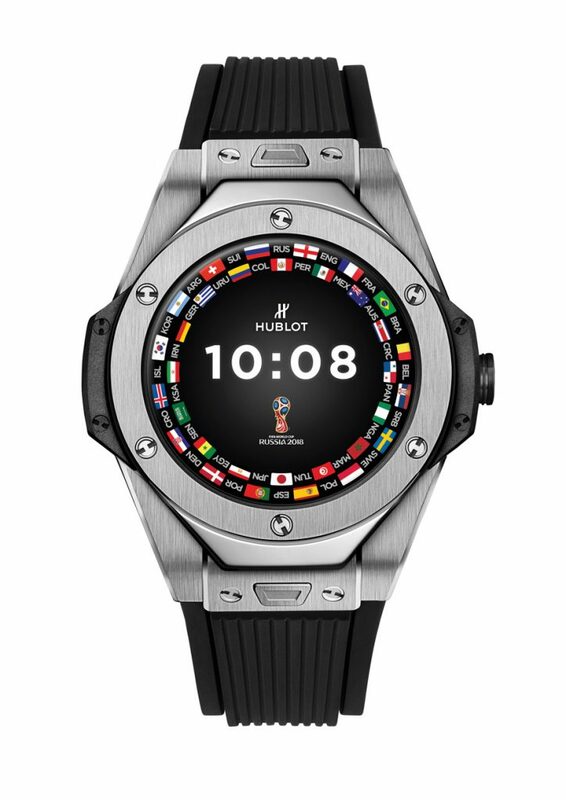 It offers 32 dials inspired by international soccer teams, and offers advanced technology that was requested by FIFA to Hublot. The FIFA request leads to an incredible change during the Matches, because for the first time ever, the referees will be aided during the 21st FIFA World Cup™ championships by digital video technology. Indeed, referees wearing the Hublot Big Bang Referee 2018 FIFA World Cup Russia™ can connect during the competition to what FIFA calls Goal Line Technology, which has been used in its cameras to determine ball trajectory and whether or not the ball fully passes the goal line. The watch, as mentioned, also offers fans a host of great soccer-related information. This includes announcing 15 minutes before the kickoff of a match, statistics during play, scores, and “goals,” among other things. Available beginning May 1 – so fans are equipped before the FIFA World Cup Russia in June – the Hublot Big Bang Referee 2018 FIFA World Cup Russia™ watch is compatible with Android (4.3 and higher) and iOs (10.5.9 and higher). For the smart watch portion of the timepiece, Hublot worked with Intel and Google, much like its sibling brand TAG Heuer (both are owned by the LVMH Group), so the technologies in both connected watches are similar. Hublot has the added soccer technology. You can read below for the entire technical specifications on the screen, processors, operating systems, sensors, compatibility, connectivity, batteries and more. The Hublot Big Bang Referee 2018 FIFA World Cup Russia™ watch is sold with a rubber strap and a specially made sponge cuff strap with the FIFA World Cup™ logo – all easily interchangeable thanks to the brand’s patented One-Click strap. Hublot is also offering for sale a host of colorful straps that relate back to the soccer teams and their colors. It retails for 4,900 Swiss Francs. 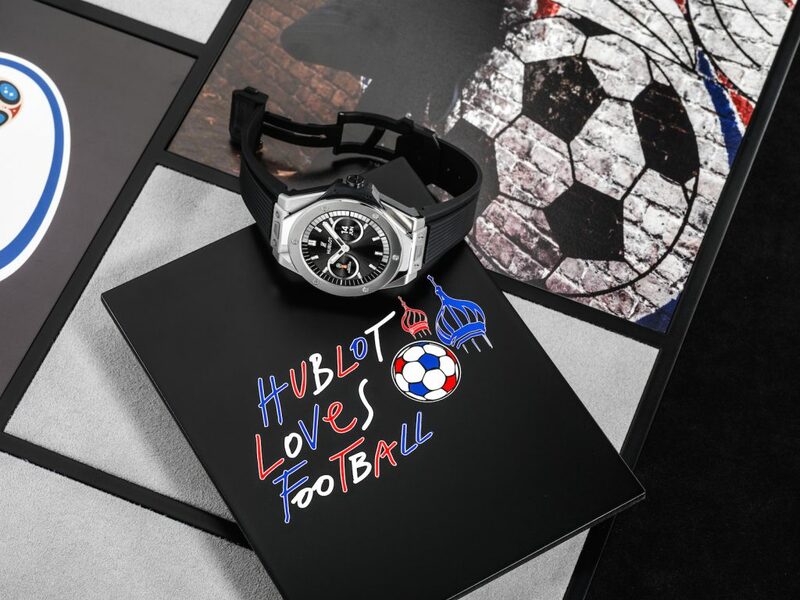 The “Hublot Loves Football” motto has been a part of the brand’s sports initiative for years. 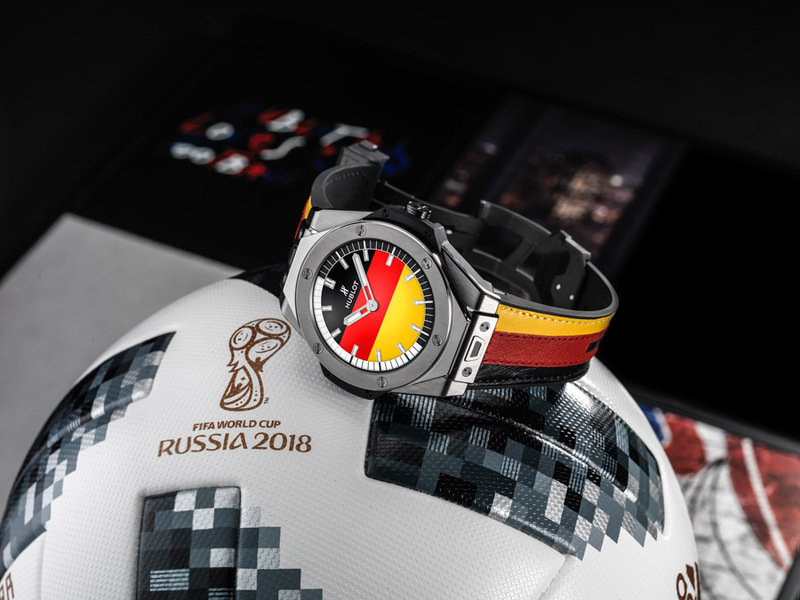 In fact, this year marks Hublot’s third participation as a branded licensee for the FIFA World Cup, and it was important to the brand to bring a watch to the table that could instantly connect football fans to every important moment of the matches. Additionally, Hublot has been involved in the world of soccer for a decade – holding different sponsorship, official watch and official timekeeper roles. It has a host of friends and ambassadors from the soccer world on its roster, including Pele’, Mardona, Mourinho, as well as the prestigious clubs such as Benfica, Chelsea and Juventus, and is the sponsor of the Swiss national team. During the upcoming FIFA World Cup™ Russia matches, fans can expect to see the brand’s famed Big-Bang shaped scoreboards and times around the pitches. Smartphones with AndroidTM version 4.3 or more recent, iPhone 5 or more recent, with minimum iOS version 10.5.9 or more recent. Supported features may vary depending on the platform.